Clinical trails in the UK and US have been conducted to study the application of stem cell to treat MS with both reporting good success rates and even disease free. No known cure. Patients are currently treated with drugs that reduces the attack intensity, modifying the disease course, or simply treating the symptoms. Multiple sclerosis (MS) is a degenerative disease where the body’s own immune system attacks the central nervous system. This happens when the white blood cells attack the neurons, affecting the fatty tissues (myelin) surrounding the nerve fibres, causing damaged myelin. 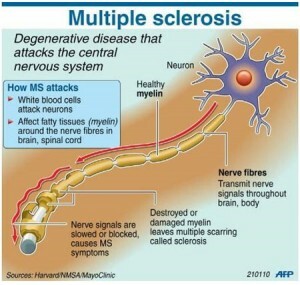 The damaged myelin causes nerve signals to and from the brain to be slowed down or blocked, causing MS symptoms. These symptoms last for varying periods of time, from 24 hours to several months. The symptoms of MS are physical in nature, where the patients would start feeling weak or having trouble walking. As the disease progresses, some may suffer from paralysis. 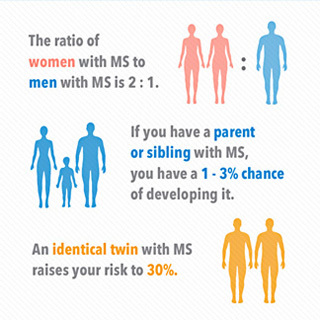 Other complications that MS sufferers experience are: tingling sensations, pain, numbness, problems with balancing, impaired vision, decreased cognitive abilities, uncoordinated body movements, slurred and or stuttered speech and also bladder and bowel movement. There are currently no known cure for Multiple Sclerosis and patients are currently treated with drugs that reduces the attack intensity, modifying the disease course, or simply treating the symptoms. Stem Cell Therapy for Multiple Sclerosis is still in research and investigative mode, however many advances have been made in this field and a number of MS patients have opted to undergo stem cell therapy as a form of treatment. In a ground breaking research conducted by Dr. Richard A. Nash of the Colorado Blood Cancer Institute in Denver called HALT-MS, 86 percent of the patients remain relapse free and nearly 91% showed no sign of disease progression out of the 24 patients that participated in the study. A summary of the report, together with it’s associated risk can be found here: Three Years After Stem Cell Transplant Therapy Most MS Patient Subjects Still In Remission. There are many ongoing efforts to understand how stem cell therapy is able to help people with MS. One of the main centres is the California Institute of Regenerative Medicine, where you can view the areas of research being conducted specifically to understand multiple sclerosis.